Social Media is a big buzz word these days. Facebook, Twitter, and YouTube are just a few platforms out there that can help you grow your online presence, improve your search engine results, and interact with your patients, among other things. 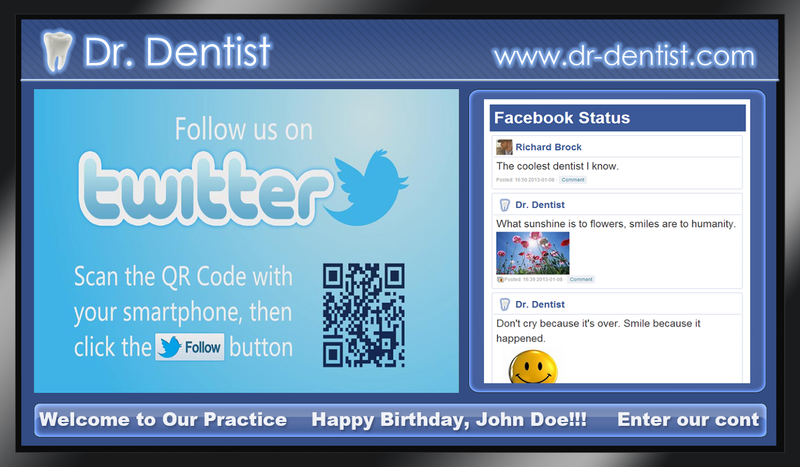 If you have a Facebook page or a Twitter profile, you can now integrate them with DSID digital signage. Displaying your Facebook timeline in-office allows viewers to see your latest posts and get in touch with your humorous/lighter side. It gives them the ability to interact and respond in real-time via their smartphones and tablets, while also providing the opportunity for them to 'Like' your page. Twitter is not as dynamic as Facebook, but can be great for growing a group of followers - if you're a regular Tweeter. 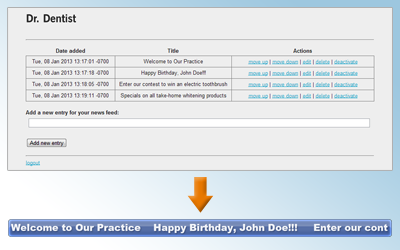 But even if you don't Tweet, you can link your Twitter and Facebook posts; so what shows up one, shows up on the other. As far as things go, the more Social Media you are using and displaying, the better, because this will reach a larger audience. Another Social Media aspect that we've developed is content that specifically promotes your Facebook, Twitter, or YouTube page. This content informs viewers that you are, in fact, 'with it', while providing them with a QR code that will link directly to the respective media should they choose to scan it with a smartphone. Contact DSID today if you have not yet taken advantage of these amazing practice-building features. Social media sites have become an extension of the communal sporting fields where parents discuss opinions about health care providers and their children's well-being. Doctors are beginning to realize that active online social media presence and interaction is a prevailing and successful marketing trend. With sites such as Facebook, doctors can now provide a place of forum for patients to give feedback and discuss, as well as giving the doctor an opportunity to engage and respond. 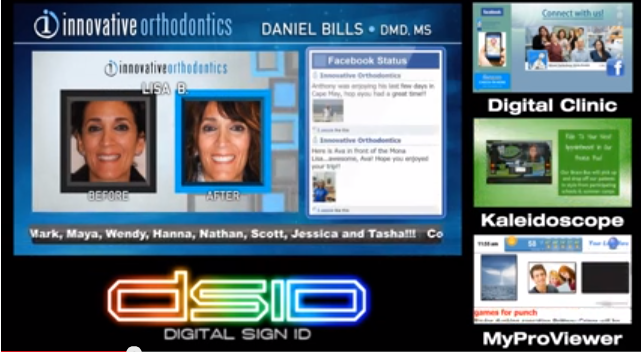 Digital Sign ID (DSID) is a predominant leader in digital signage for the dental fields and has fully implemented interactive, real-time social media for all client displays. The addition of social media helps draw viewer interest to a display, opening them up to further practice information and marketing messages. Simply displaying social media is good for this. However, providing the option for real-time, in-office interaction is even more powerful and effective. 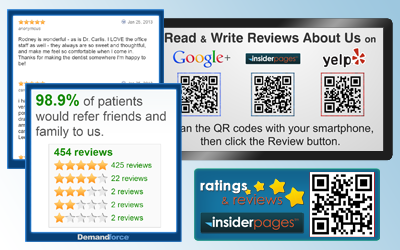 Once having gained a viewer's attention, the display now becomes an interactive portal to a doctor's social media site. This allows for relevant, in-office communication about products and services, as well as positive patient feedback. DSID's clients who have implemented the real-time social media feature in their displays have noticed significant increases in comments, recommendations, and overall traffic on their social media sites. Digital signage and social media is a perfect marketing media mix that will undoubtedly continue to evolve, allowing for even greater patient interaction. 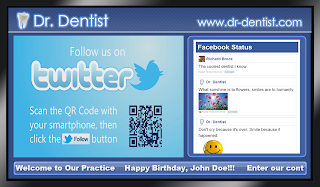 DSID's digital signage currently incorporates the main social media sites, including Facebook, Twitter and Demand Force. Contact DSID today to discuss a custom developed digital display utilizing interactive social media features that can boost your online social media presence.